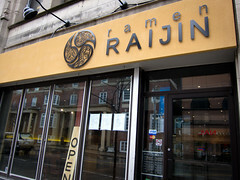 Ever since my blog post about ramen in Toronto, the BF and I have been craving a good bowl of noodles. Two weeks ago, we were actually out of the door and almost at the subway before I remembered Sansotei was closed on Sundays. So last weekend we headed over to Niwatei in J-Town, which was on the way before starting our weekend errands. Atmosphere: It seems like Niwatei has moved recently from their own store to a shared location with Green Grotto Cafe. The space feels very incomplete with a half painted wall mural and there’s little to differentiate the two restaurants. 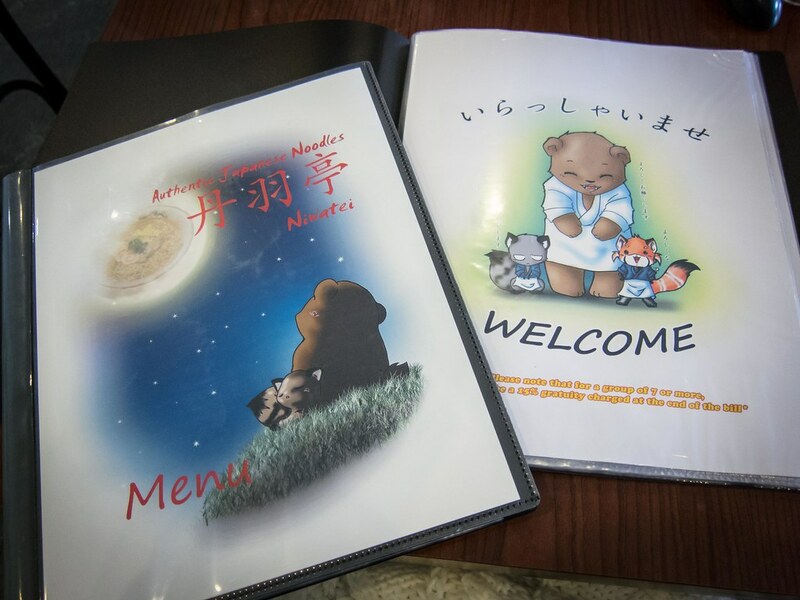 Many patrons walked through “Niwatei” to find a table for Green Grotto Cafe. Tables were set up at the entrance selling pretty bowls, teapots and plates. It felt like a mix between a high school cafeteria and food court with table service. One of the walls is lined with hand drawn art featuring Niwatei’s animal mascots in various scenes. Service: Our server let us chose any empty table, set out menus (the cutest menus ever) once we were seated and took good care of us throughout the meal. My water was consistently refilled, each course arrived quickly and was cleared before the next. I liked how she brought out two spoons for the BF and I to share dessert without me even asking. 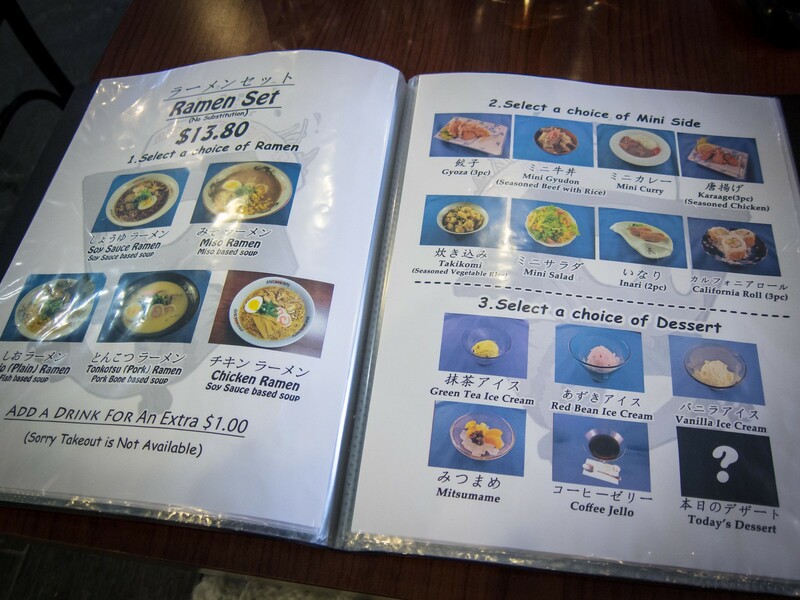 Food: Looking at the menu, the ramen set options for $12.80 were a great deal. 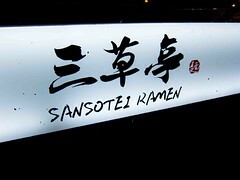 The sets are available only at dinner or on weekends and includes a bowl of ramen, a choice of a side dish and a dessert. Since both the BF and I were craving tonkotsu ramen, we decided to order one bowl and one set to taste the side and dessert. Out of the options, I chose the mini curry rice and chiffon cake. The plate of mini curry was ok, my favourite part was the chewy, pillowy, sweet sushi rice that was used. The curry was on the runnier side with small pieces of onion and carrots. 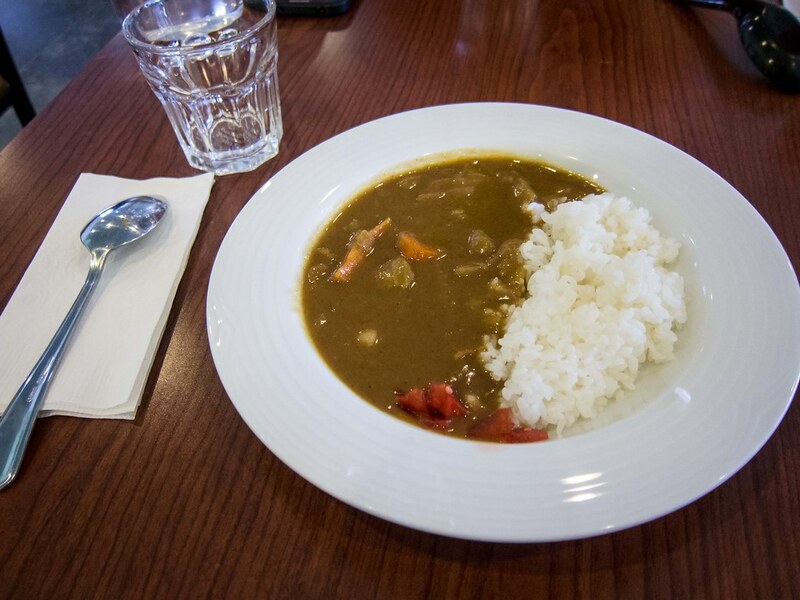 It was good but wasn’t anything that couldn’t be achieved at home with cubes of Japanese curry seasoning. Our bowls of noodles arrived piping hot and looked promising. Starting with the standard toppings, the egg was soft boiled but not marinated. 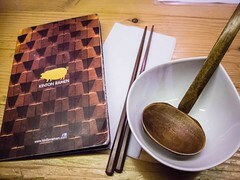 I liked the fish cakes, scallions and pickled ginger but there was no bamboo. 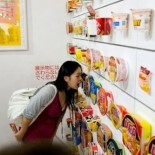 Corn and seaweed can be added at an additional charge. The two slices of chashu were buttery soft and well flavoured. The only downside was that there were only two small slices. The noodles had a great chewiness and curl, great for slurping. 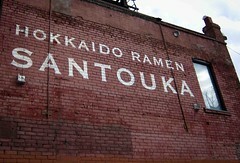 For me, the star of the ramen was the broth. The milky soup was rich and savoury, full of pork flavour but not salty. I drank every drop in the bowl, enjoyed each spoonful and didn’t have to guzzel water through the afternoon. By this point my ramen craving had been well satiated and I had forgotten that there was still dessert to come. 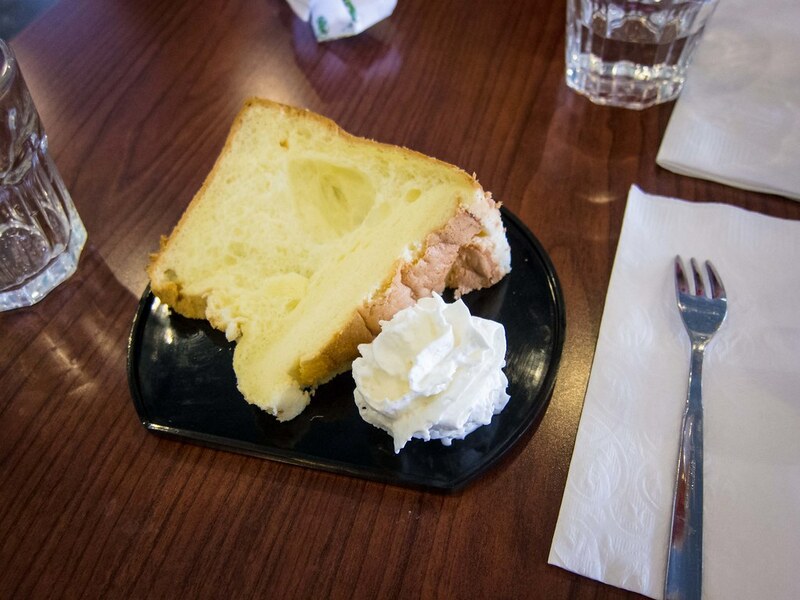 The arrival of the plate of chiffon cake and whipped cream was a happy surprise. The cake was airy, fluffy and lightly sweet, a great way to end the meal. If it’s available, I would recommend the cake over the standard ice cream choices. The coffee jello is surprisingly good. 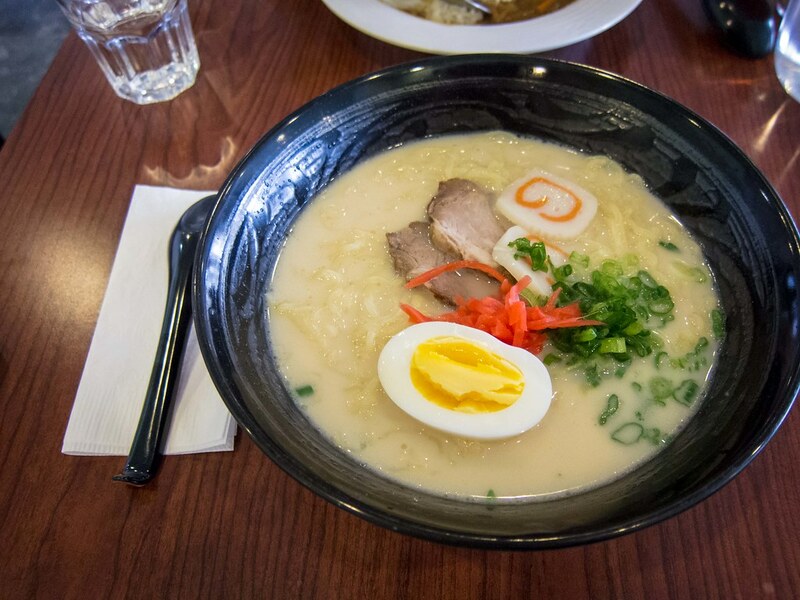 I wonder if they’ve changed the ramen they use — when I went, it was great & chewy at first, but then got soft as it cooled down to slurpable temperatures. It’s also very possible that I ate it super fast, haha I was pretty hungry at the time.